Dartmoor is scenically situated on the Glenelg River in south-west Victoria, 400 km from Melbourne and 500 km from Adelaide on National Highway One. It is central to, and within 100 km of tourist destinations like the: majestic Grampians, renowned Coonawarra wineries, remarkable Blue Lake of Mt Gambier and surrounding limestone caves and sinkholes, picturesque Discovery Bay and Lower Glenelg National Parks, Mary McKillop Trail, rolling inland hills of "Australia Felix" and historic seaports of Port Fairy and Portland, Victoria's birthplace. 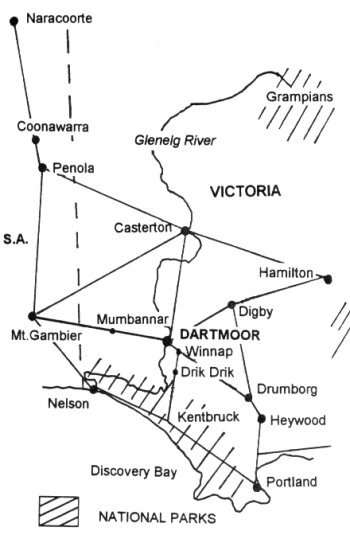 The Dartmoor district has an intriguing appeal and history of its own, from Koori times, through surveying by explorer Major Mitchell and the age of pastoral expansion, to its growth as a lasting centre of prime grazing production and the epicentre of the softwood plantation industry. The town of Dartmoor has full amenities for travellers and tourists and prides itself on its commitment to community involvement. The community has won several state and regional awards in the "Tidy Towns" competition, and in the "Year of the Family 1994" was one of only 4 Victorian centres to be recognised as "a Family Friendly Place to Live and Visit". You are welcome to come and see why.